Around Buffalo, there is a controversy over who is the original "King of Wings". But according to almost everyone in Tuscaloosa, Alabama, Phillip Weaver orchestrated their migration to the South. Having already established himself as a successful business person by his early 20's, with a convenience store and a deli on the University of Alabama campus, Phillip was not content to simply attend college and oversee his business. He searched for a unique product to introduce as the signature item in a new, quick-service restaurant he envisioned. After trying Buffalo wings on various travels, Phillip decided to formulate unique hot sauces and the process of using fresh-cut chicken wings for his new restaurant. In 1980, Wings & Things opened for business. Phillip quickly found himself faced with the challenge of getting Southerners to try his spicy wings. Most people in the South were accustomed to thinking of the wing as a less desirable part of the chicken. But through product sampling to local businesses and to students on the University of Alabama campus, Phillip soon found Wings & Things becoming a popular gathering place. The quality and uniqueness of his wings, as well as offering other freshly prepared menu items (such as fresh-cut, curly-Q French fries cooked to order, chicken finger sandwiches and platters, spicy cajun chicken sandwiches, down-home burgers, crisp salads, and a wide variety of domestic and imported beers) has proven to be a winning combination. Buffalo Phil's is the culmination of what began as a modest idea to offer a fresh and innovative product to the people of Tuscaloosa, Alabama. 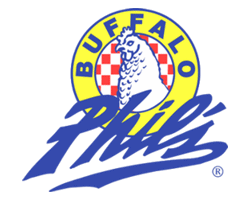 In 1992, a new name for Wings & Things - Buffalo Phil's - was introduced to offer a unique name and trademark for his dynamic and successful restaurant venture. As you have discovered, Buffalo Phil's is the leader in offering the public the "best Wings in the World." We want to be the premier quick-service, limited-menu (but served with a flair) restaurant with an excellent price value, specializing in Buffalo wings.